A Talmudic author and principal of the Talmudic colleges of Salonica and Smyrna in the first half of the seventeenth century. He was a pupil of Asher ha-Kohen ben Ardut, and became one of the foremost teachers in Turkey. The best known of his pupils is David Conforte, author of the historical work, "Ḳore ha-Dorot." 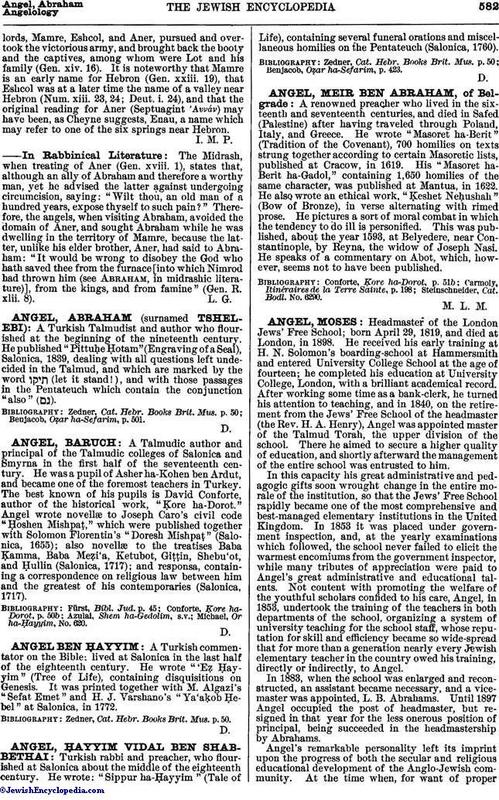 Angel wrote novellæ to Joseph Caro's civil code "Ḥoshen Mishpaṭ," which were published together with Solomon Florentin's "Doresh Mishpaṭ" (Salonica, 1655); also novellæ to the treatises Baba Ḳamma, Baba Meẓi'a, Ketubot, Giṭṭin, Shebu'ot, and Ḥullin (Salonica, 1717); and responsa, containing a correspondence on religious law between him and the greatest of his contemporaries (Salonica, 1717). Michael, Or ha-Ḥayyim, No. 620.